Well...someday I'll make a proper page. Small update:Ok, seeing that I have visitors from places other than the runuo forum, perhaps I should make some kind of feedback system. In the meantime, feel free to mail ggg(at)fnord(dot)se or ICQ 5239728 with any bugs or feature requests. Another small update:Unless you have figured it out this thing is discontinued. It is probably broken aswell, and since I have left the Evil Empire<tm> behind (at least for now) I really can't do much about anything (wrong OS, no development utilities...and I highly doubt it runs under mono). I recommend taking a look at GumpStudio. The program is here (last update 20031218 08:52). 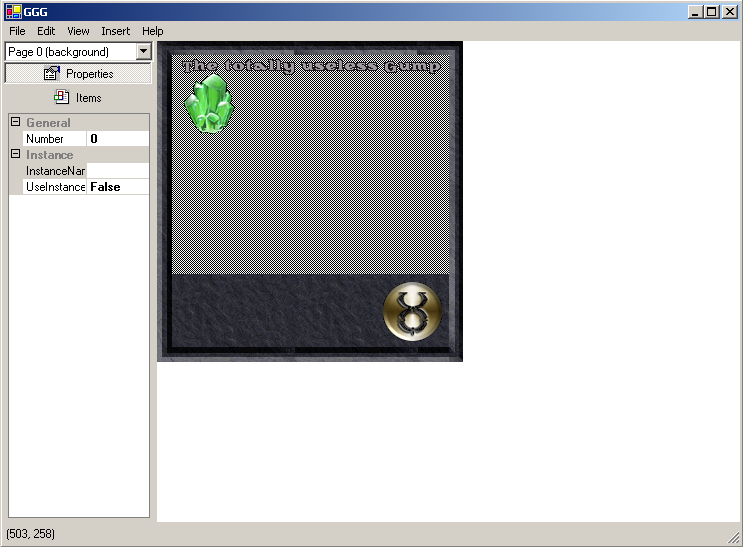 You will need the Ultima Online SDK (available here), the .NET framework and Ultima Online to get this to run. And of course, the screenshot. Note: Prior to the 1.0 release (which I highly doubt will ever exist) the save format is considered unstable and subject to change at any time.